Millions took to the streets to take part in May 1 demonstrations around the globe. From union rallies to protests and clashes with police, the International Labor Day events drew attention to the issues of austerity, unemployment and workers rights. 06:48 GMT: Canada’s Montreal police detained 300 protesters following a May Day rally demonstration in Old Montreal organized by the Anti-Capitalist Convergence, or CLAC group. Police declared the rally illegal shortly after it started, citing Montreal’s controversial public order bylaw P-6, which makes it illegal to participate in an gathering with a face obscured by a scarf, hood or mask, and requires protesters to disclose to police the location and itinerary of their demonstration ahead of time. 05:50 GMT: Four more Seattle arrests have been made, bringing the total to 17. 04:20 GMT: The arrests of 13 protesters in total have been confirmed by police officials. Local reporters documented the scenes. 03:30 GMT: Seattle Police Department confirmed the continued usage of pepper spray. One journalist reported being hit. 03:44 GMT: Police clad in riot gear and officers using their police bikes as shields attempt to rout and disperse protesters through downtown Seattle. Local TV broadcaster KIRO depicted scenes of flash bombs and several demonstrators hit with pepper spray. 23:50 GMT: Thousands have marched in downtown Los Angeles to protest immigration policy, as part of the marches taking place across the country. The rallies coincided with Congress discussing a new bill that would give a path to US citizenship to some 11 million illegal immigrants. 23:45 GMT: In Mexico, workers, teachers and students gathered in the capital, Mexico City, to demand social reforms. The event ended with people throwing all manner of objects at the police, including street barriers. The authorities retaliated with shields and batons, with a violent brawl ensuing between both sides. All main streets in the city are now closed, following hours of chaos and violence. The group of people had gathered at the Plaza de Constitucion and headed in the direction of the city’s main square – ‘El Zocalo’, waving banners with images of the revolutionary legend Che Guevara and spray-painting slogans amongst which the anarchy symbol proved numerous. Approximately 10,000 workers and up to 15,000 students and teachers from remote states, including Oaxaca, Chiapas and Michoacán, were present as well, demonstrating their opposition to newly-passed labor reforms. 23:30 GMT: Huge rival May Day rallies have been held in Venezuela with the opposition and the supporters of the newly-elected President Nicolas Maduro taking to the streets of Caracas and across the country. The marches come amid a continuing dispute over the results of last month’s presidential vote which saw the hand-picked successor of late leader Hugo Chavez beat opposition candidate Henrique Capriles. 23:00 GMT: Hundreds of thousands of Cubans were joined by around 2,000 labor union activists from over 73 countries as they marched with banners bearing the images of Cuban leaders Fidel and Raul Castro in Havana on the International Day of Labour, also known as May Day. Using the slogan "United for Prosperous and Sustainable Socialism", the marchers also carried portraits of recently deceased Venezuelan President and Cuban ally Hugo Chavez. 22:23 GMT: At least five people were arrested at a demonstration in New York City as police hounded approximately 150 May Day protesters en route to Union Square Park. 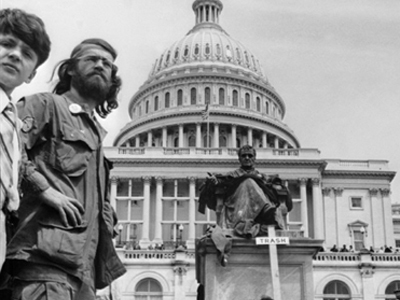 As a procession of demonstrators marched toward the rallying point, a faction ran into the street waving red and black flags, denouncing capitalism. Witnesses told The New York Times that police chased the protesters into the street, forcing one to the ground violently. Others in the crowd cursed and shouted at the police as uniformed officers pushed through the marchers, pushing pedestrians and news photographers alike. 21:00 GMT: Thousands of protesters marched on May Day in London to celebrate International Workers Day. The protest was dominated by communist supporters, mainly of Turkish origin. Groups and organisations protesting included 'Alevi Turkish Youth UK' wanting more support for workers' rights, left-wing Turkish football team Kartal Haber, the Communist Party of Great Britain (Marxist-Leninist) - a party guided by scientific socialist and communist understanding and principles - and anti-capitalist groups. 20:00 GMT: German police deployed water cannon against thousands of protesters in Hamburg as May Day riots rocked the northern German port city on Wednesday. Protesters hurled bottles, stones and firecrackers at police in the demonstration, held to give solidarity to southern European states hit by the global economic downturn. Around 1,600 police officers shadowed the protest march closely in the city's Altona district, which kicked off in Spielbudenplatz at 10:30 local time (08:30 GMT). Protesters marched under banners proclaiming anti-capitalism, demanding an end to long working hours and dwindling salaries. 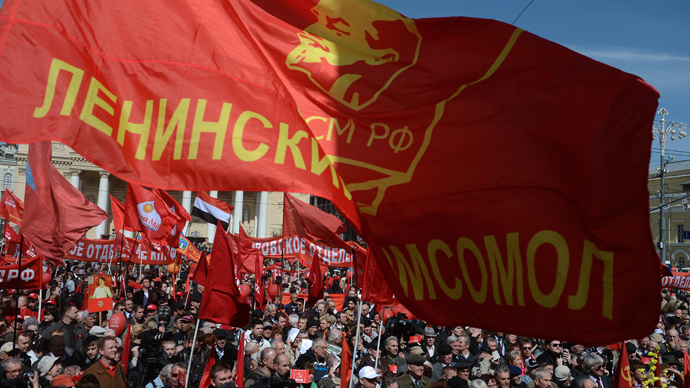 Protesters brandished the flag of the communist movement, emblazoned with a golden hammer and sickle to show their opposition to the capitalist policies they blame for tearing the region asunder. 19:17 GMT: More than 400,000 people attended events marking the Labor Day in Germany, according to the country’s unions. However, the media’s attention was locked to separate rallies organized by German far-right extremist groups, as clashes with anti-fascist demonstrators and the police were anticipated. In Berlin the police had to remove several activists, who chained themselves to a concrete weight to block the way of a 250-strong march of the far-right extremist NPD party supporters. Some 2,000 leftists were also reportedly pushed back by the police to avoid direct clashes. Meanwhile, the head of German Trade Union Confederation (DGB) Michael Sommer said the German government should do more to help the rest of the euro zone. “We cannot allow this continent to be ‘kaputtgespart’ - forced to save so much that it breaks apart,” Sommer said as quoted by Reuters. 16:52 GMT: A protester was arrested in the Danish city of Aarhus after attempting to shoot at the country’s Prime Minister Helle Thorning-Schmidt, with a water pistol, AP reported. Those demonstrating against planned public sector cuts met the PM’s speech with booing and pictures of unhappy faces. 14:41 GMT: Thousands of people have taken to the streets of the Spanish capital, Madrid, carrying placards with slogans against austerity. “There has never been a May 1 with more reason to take to the streets,” the head of the Spain’s UGT union Candido Mendez said at the Madrid demonstration. The unemployment level in Spain has hit a record-breaking 27 per cent and the country’s economy has been shrinking for the last seven quarters. 13:47 GMT: Water cannons and teargas were used by riot police in the Turkish city of Istanbul to disperse the May Day marchers trying to reach the main city square. At least 12 people have been injured in clashes, according to AFP, including the agency’s photographer. Police have reportedly started arresting the demonstrators. “Work is fundamental for dignity. I think of labor market difficulties in various countries. I think of people, not just young people, who are unemployed often because of an economic conception of society based on selfish profit outside the bounds of social justice,” Pope Francis said. 10:36 GMT: The annual march of the French far right party Le Front National to celebrate Joan of Arc, which takes place on May 1, brought out the party’s president Marine Le Pen, as well as vice-president Florian Philippot. 10:05 GMT: Fifty-five thousand Indonesians, wearing costumes symbolizing ants to show the exploitation of workers, protested against labor outsourcing policy and low wages in Jakarta. Security was stepped up for the rally. 09:35 GMT: At least four people have been injured in clashes between police and demonstrators in Turkey, following the security forces using teargas and water cannon. 09:15 GMT: Ferry and train services in Greece have stopped due to the general strike for May Day. Hundreds of Greeks are gathering for rallies, protesting the highest unemployment in the EU, as well as the harsh austerity measures. 08:35 GMT: Tens of thousands take to the streets in North Korea to celebrate May Day. 08:21 GMT: Indian members of the All India Trade Union Congress (AITUC) have participated in a rally in Hyderabad. 08:10 GMT: In Bangladesh, tens of thousands took to the streets to demand the execution of textile bosses over the collapse of a factory complex, with the final death toll threatening to topple 500. 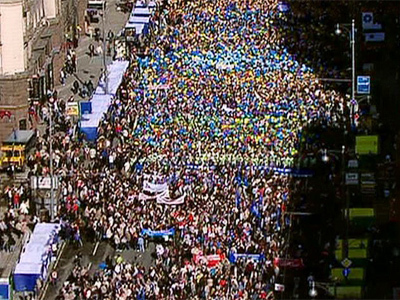 07:40 GMT: Seventy thousand people are already taking part in the May Day rally in central Moscow, according to police. This means the organizers have already exceeded the number of agreed participants by 10,000 people. 07:34 GMT: Public transport has been suspended in Istanbul as part of local authorities’ precautions to curb any illegal gathering in Taksim Square during May Day. 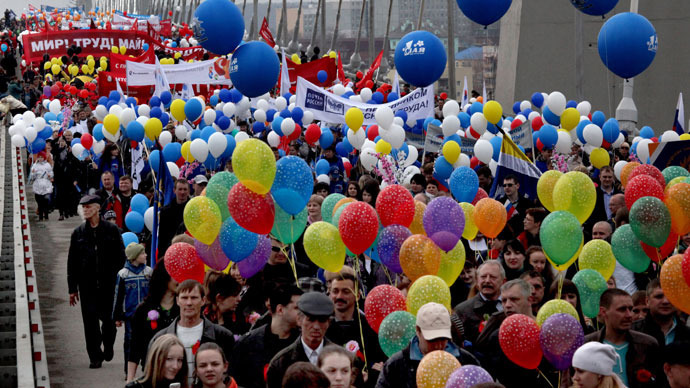 07:25 GMT: Some 90,000 people are expected to participate in the May Day demonstrations in Moscow. 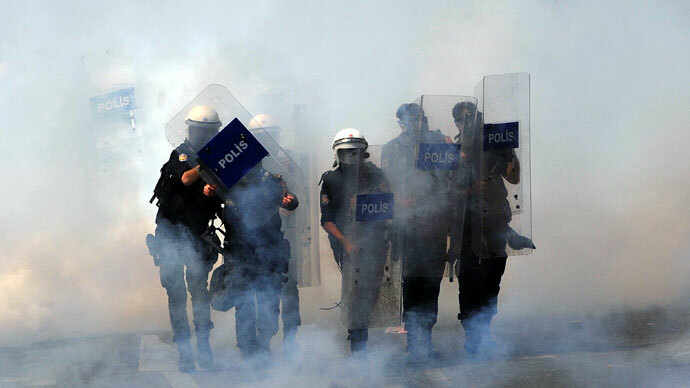 07:15 GMT: Turkish police clash with May Day protesters in Istanbul, using water cannons and teargas to disperse crowds. 06:50 GMT: Cambodian workers have taken to the streets of the capital, Phnom Penh, to call for a pay rise. 06:30 GMT: Traffic has been blocked in the center of Moscow due to the May Day demonstrations that are set to involve tens of thousands of people. Some of the streets in the heart of the Russian capital have become pedestrian-only for the day. 06:07 GMT: In Russia’s Far-Eastern city of Vladivostok, 40,000 people have taken part in the May Day demonstrations, with many of them brought to the regional center by shuttle buses. 05:30 GMT: Throughout the world, nations are celebrating International Labor Day on May 1. Dozens of events will be unfolding during the day, including an all-out strike in Greece, anti-euro demonstrations across Europe and massive demonstrations across Russia.